In 2001, my husband and I visited Nepal to trek. We did not have children at that time, but we said that if we ever did have kids we wanted to come back as a family. 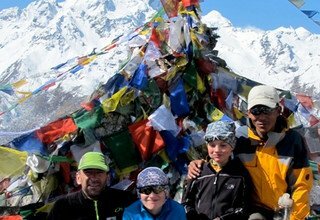 In 2014, we decided to travel back to Nepal with our 11 year old and 8 year old sons. Travelling on such a big adventure with children, we wanted to go with a company who would understand our needs as a family and ensure that everything was safe, secure and enjoyable so that we could have an amazing experience with our kids. Swiss Family Treks helped us have the trip of a lifetime! Our memories of our month in Nepal have filled our hearts and souls for many years to come. The countryside of Nepal is breathtaking and stunning, but some of our best memories are of the wonderful people we met along our treks. I still smile when I think of us walking through the Himalayas with our amazing guide singing in Tibetan as we travelled along. 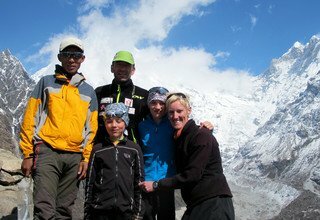 We made great friends with the porters and I have memories of my children trekking along with them side by side chatting about their lives. All of the staff that we met through SFT were amazing, professional, kind and spoke highly of the company they worked for. While we did not know it at the time, we feel even more pleased that we chose SFT to help us on our trip when we heard the people who work for them speak so proudly of the company. Limits on the weight of porter loads and only using local guides from the areas to encourage employment in their home region were just some of the initiatives that we heard the guides and porters talk about. We felt proud to use a company who treated their amazing employees with respect and fairness. Our children made us proud with their ability to travel with their eyes wide open and their heart accepting of everything around them. They travelled with ease and I believe they will be better people because of this rich experience. I thank SFT for giving us the comfort and confidence to embark on such an enormous and profound family experience!